For Catholics, the Sacrament of Baptism is the first step in a lifelong journey of commitment and discipleship. Whether we are baptized as infants or adults, Baptism is the Church's way of celebrating and enacting the embrace of God. Preparation class is required for first-time parents prior to Baptism. To make arrangements for a child's baptism, contact the parish secretary, Mikey Bancroft at 724-748-6700 ext 100; to arrange for an adult's baptism, contact Deacon Owen at ext 110. 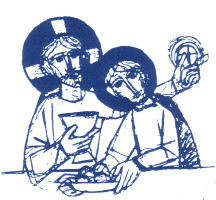 Catholics believe the Eucharist, or Communion, is both a sacrifice and a meal. We believe in the real presence of Jesus, who died for our sins. As we receive Christ's Body and Blood, we also are nourished spiritually and brought closer to God. To make arrangements for a child's First Eucharist, contact Michelle Boarts at 724-748-6700 ext 116; to arrange for an adult's First Eucharist, contact Deacon Owen at ext 110. The Catholic Sacrament of Reconciliation (also known as Penance, or Penance and Reconciliation) has three elements: conversion, confession and celebration. In it we find God's unconditional forgiveness; as a result we are called to forgive others. To make arrangements for a child's first Reconciliation, contact Michelle Boarts at 724-748-6700 ext 116; to arrange an adult's Reconciliation, contact Deacon Owen at ext 110. Confirmation is a Catholic Sacrament of mature Christian commitment and a deepening of baptismal gifts. It is one of the three Sacraments of Initiation for Catholics. It is most often associated with the gifts of the Holy Spirit. To make arrangements for a child's Confirmation, contact Angie Felicetty at 724-748-6700 ext 112; to arrange an adult's Confirmation, contact Deacon Owen at ext 110. For Catholics, the Sacrament of Marriage, or Holy Matrimony, is a public sign that one gives oneself totally to this other person. It is also a public statement about God: the loving union of husband and wife speaks of family values and also God's values. To make arrangements for a wedding, contact Mikey Bancroft at 724-748-6700 ext 100; arrangements must be made six months in advance. The Catholic Sacrament of Anointing of the Sick, formerly known as Last Rites or Extreme Unction, is a ritual of healing appropriate not only for physical but also for mental and spiritual sickness, and can be repeated as often as necessary. This Sacrament is celebrated during Masses several times during the year; if you or a loved one would like to be anointed, contact parish secretary Mikey Bancroft at 724-748-6700 ext 100.